A Nightmare on Elm Street was one of the most popular horror movie franchises in the 1980’s. The burnt serial killer known as Freddy Krueger is the main antagonist in these movies. In this article, I look at all official and notable fan-created video games based on A Nightmare on Elm Street movies or Freddy Krueger. 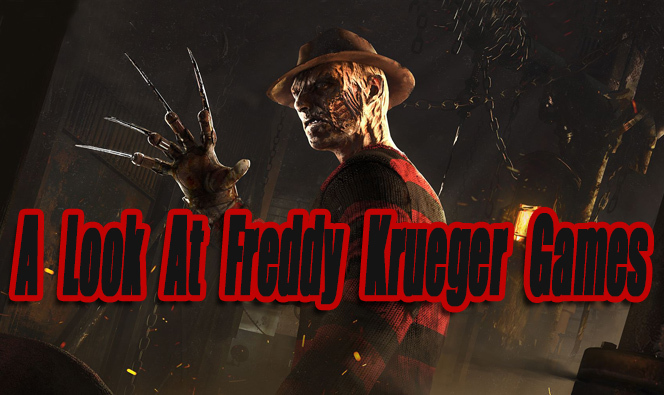 When new Freddy Krueger games are released this article will be updated. A Nightmare On Elm Street was released for MS-DOS/C64 PC’s in 1989. 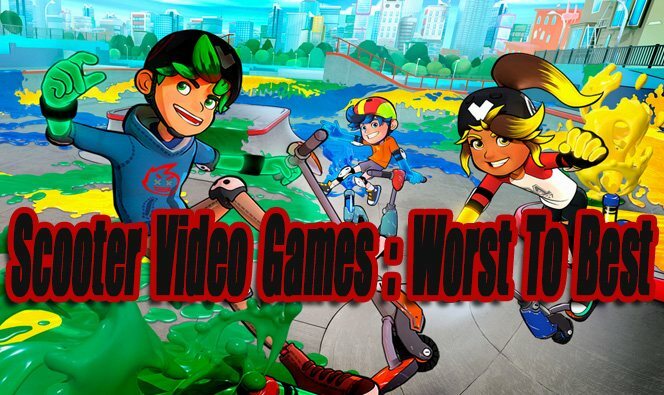 This was the first official video game released, and also the worst. 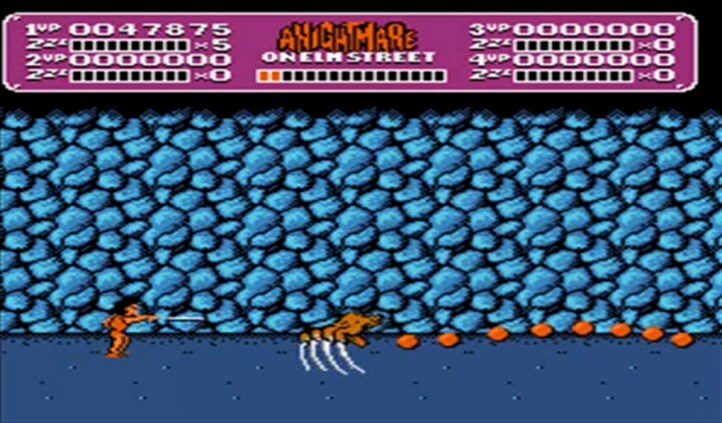 This game is based on the third movie A Nightmare on Elm Street 3: Dream Warriors. When starting the game you can choose to play as one of five characters (AKA: Dream Warriors). Your goal is to find Freddy’s house and save the other 4 dream warriors. 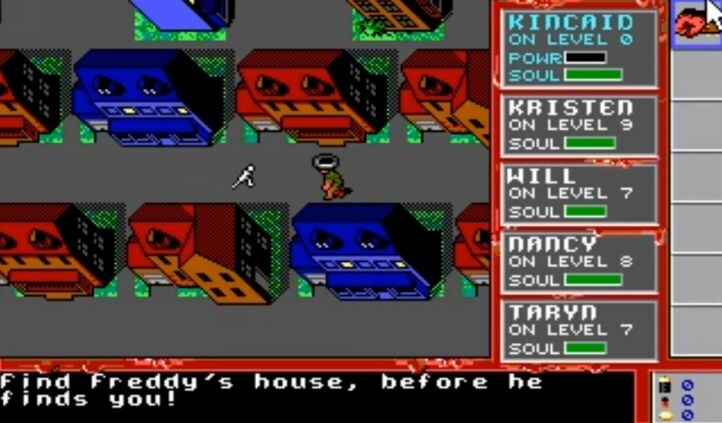 Freddy’s house is a giant maze that consists of multiple levels. In each level, you’ll have to find keys, pull hidden switches, and collect items in order to solve puzzles. You’ll also encounter a variety of strange enemies like possessed furniture, ghosts, and ghouls. My biggest problem with this game is the dumb mandatory puzzles, they are boring and don’t make any sense. By level 3 I became frustrated with this game and quit playing it. Overall A Nightmare On Elm Street MS-DOS/C64 was a below average game in 1989 and it’s even worst when playing it in 2018. A Nightmare On Elm Street for the NES is a little better than the MS-DOS game. This is 2D side-scroller filled with long hallways, locked doors, enemies, and boss fights. Playing as a teenager the main object of the game is to collect bones. Collecting bones are needed to unlock doors and other passageways required to progress through the game. When all bones are collected the final fight with Freddy Krueger will commence. Be sure to watch your “Dream Meter”, if it runs out you’ll fall asleep and have to play through the harder dream world until you find a music box. 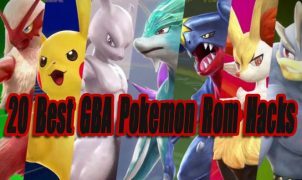 This game has a large variety of enemies that weren’t in any of the movies such as zombies, bats, rats, snakes, skeletons, and more. I wonder if this was a Halloween themed game reskinned as a Nightmare On Elm Street game. Overall I thought A Nightmare on Elm Street for the NES was a mediocre game. I did not like the locked doors, long Elm street walks, and the easy last boss fight. The gameplay is moderately fun though. Freddy’s Back: A Nightmare On Elm Street Episode 1 and 2 are fan created 2D Horror RPG games. Freddy’s Back has a unique story unrelated to any of the movies, however, some areas and characters from the movies make appearances in these games. 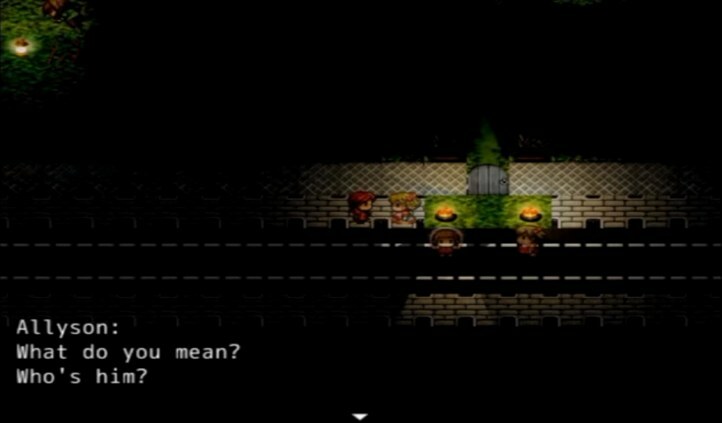 You’ll play as a girl named Allyson who runs into a mysterious child that tells here “he’s coming”, then the child disappears. Soon you’ll find yourself on Elm Street in front of Freddy’s house. I thought the level design, music, characters, and story were done really well. The gameplay scenes where Freddy is chasing you are fighting and feel similar to the movies. These games are short in length but worth a playthrough, especially if you’re a fan of the movies. When writing this I tried not to spoil too much of the game. The less you know about Freddy’s Back, the better your gameplay experience will be. Both Episodes are completely free to download and play on Windows PC’s! Dreams Of Rage is a fan created Nightmare On Elm Street 16-Bit Beat ’em up game. Freddy Krueger is on a murderous rampage! He has unleashed an army of past victims and hellish demons upon the world. It’s now up to the dream warriors to stop Freddy Krueger before it’s too late. There are 4 playable characters (AKA: Dream Warriors) to choose from. Each dream warrior has basic attacks, along with a unique special attack move. 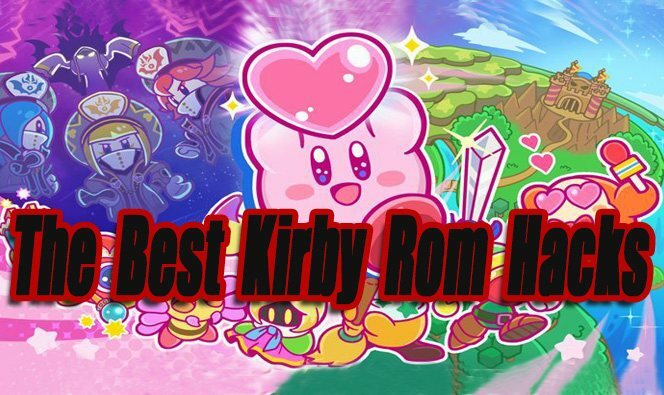 I really liked the music, level designs, story, and Freddy Boss fights in this game. 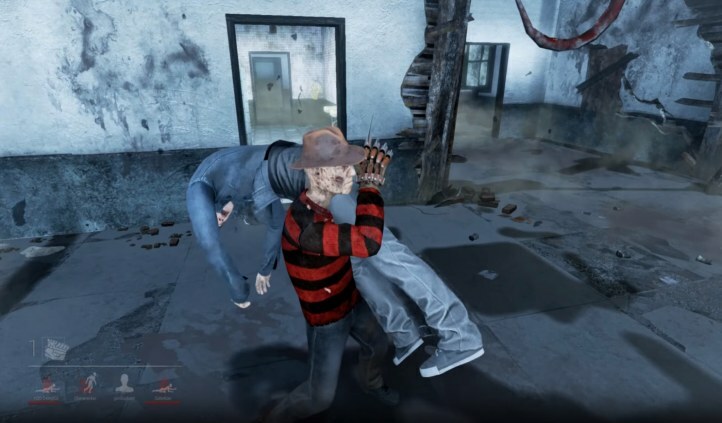 Every fight with Freddy is unique and the end of each level Freddy comes back as a different monster. Scenes from the Nightmare On Elm Street movies are merged well into Dreams Of Rage’s story, making it feel like an official game. For a Beat ‘Em up game Dreams Of Rage is long, clocking in at over 2 hours. I have to give props to the developer HandsnFeetFace for creating the best Freddy Krueger game so far. Every beat ’em up fan should play Dreams Of Rage. The following games are not based around Freddy Krueger, but they do feature him as a playable character. 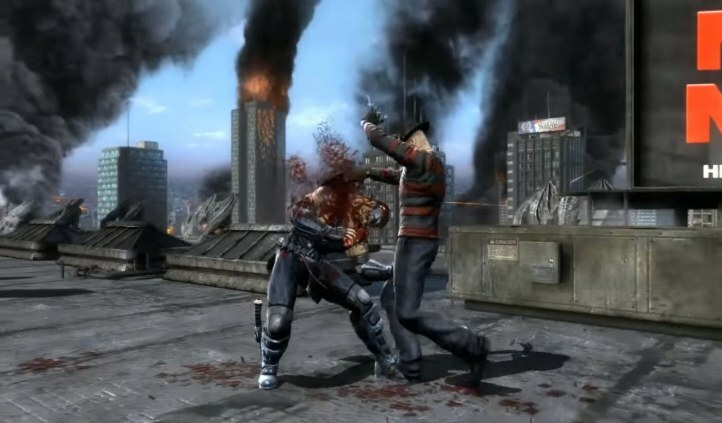 Freddy Krueger first appeared as a DLC character in the 2011 Mortal Kombat fighting game. The extended version is known as the “Komplete Edition” was released in 2012 and included all previous DLC characters and stages. 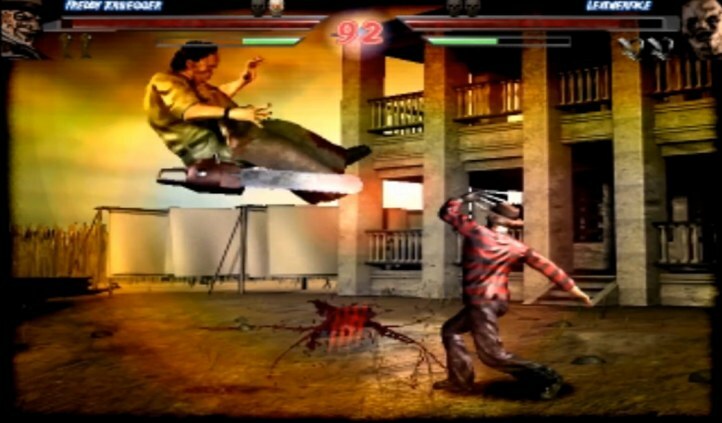 In my opinion, Mortal Kombat did the best job at showcasing a realistic video game version of Freddy Krueger. His voice, movement, combat moves, and bloody fatalities all stay true to his movie persona. There is a Nightmare On Elm Street DLC available for Dead By Daylight. The DLC includes a new survivor, playable version of Freddy Krueger, and a new map (Badham Preschool). Dead By Daylight is a 1 vs 4 online multiplayer game. You’ll play as 1 of 4 survivors or a serial killer. If you’re a survivor you must hide and look out for fellow survivors. If you’re a serial killer you must kill all 4 survivors before they escape. Freddy Krueger fits perfectly in as a serial killer and has some cool attacks. 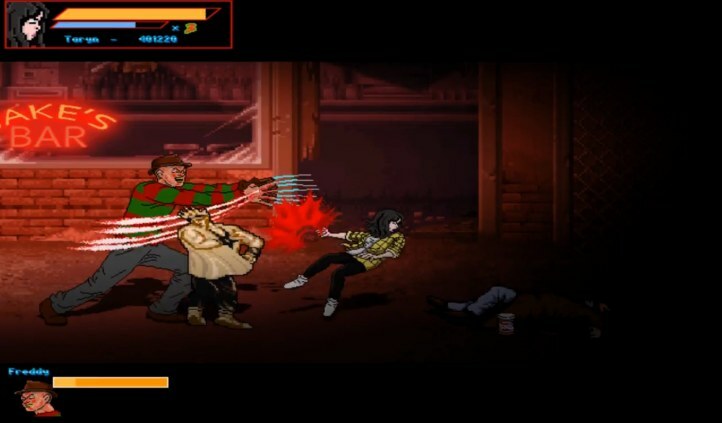 Terrordrome is a neat fan created 2D fighting game that features a large roster of famous horror movie characters. 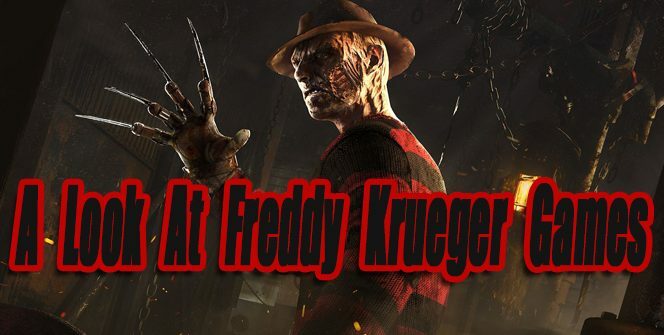 Freddy Krueger is among the roster of playable characters. Freddy has his own unique move set and fatality. Freddy also has his own fighting stage in this game known as Freddy’s Lair.